What is the age criteria for senior citizens under Income Tax Act of India? This post explains about Senior Citizen under Income Tax Rules of India. Who is eligible to claim Income Tax Exemption under the term Senior Citizen? What is the age limit to become a senior citizen in India under Income Tax rules? Any Indian resident citizen whose age is 60 years or above at any time during the respective year falls under the term Senior Citizen under Income Tax Rules. Mr. Aarav, a resident of India attained the age of 60 years during the financial year 2016-17. Will he qualify as Senior Citizen under Income Tax rules for the financial year 2016-17? Yes, since Mr. Aarav is a resident and he attained the age of 60 years during the year 2016-17, he will be treated as a senior citizen under the Income-tax Law for the financial year 2016-17. Mr. Mohammad, an India now 60 years residing in Dubai during this financial year 2016-17. Will he fall under the definition of Senior Citizen under Income Tax Rules of India? The answer is no. Because, as per Income Tax Rules, an Indian citizen who attains the age of 60 years must be a resident of India. Hope, the above information clearly explains about Senior Citizen under Income Tax Act of India. 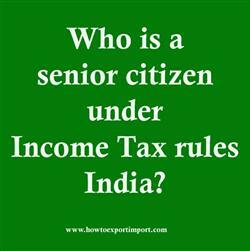 The above information explains about the term SENIOR CITIZEN under Income Tax Rules of India. Share below your thoughts about Senior Citizen under Income Tax Act of India. T. Venkareswarlu: On 07 March 2017 My date of birth is 07-011957. I retired as a teacher on 31-01-2017.Can I claim Income Tax benifitsas a Senior Citizen? Note: My salary income at the age of 59.